My dentist could take a lesson from my barber. It sounds ridiculous. What could one possibly have to do with the other? But, after visiting a barber’s website recently and booking an appointment online, I began to yearn for widespread adoption of A.I. chat. Sure, I happen to work for a developer of such products, and I’m definitely not tech-shy, but I’m also an average Joe who gets his hair cut and his teeth cleaned. I didn’t realize the hassle involved until the hassle disappeared. After I booked my haircut online, I received an instant confirmation text. An email reminder hit my inbox the day before the appointment. When I arrived at the barber shop, I checked in using their app. After my haircut, I received a digital receipt and a link to leave feedback. Since they’d made it easy, I left a glowing review. Point, barber. Compare that to the process of finding a new dentist. I searched online reviews and decided on a dentist just up the street. Their website wasn’t much help, and they weren’t on social media. I called their office, only to receive a recorded message asking me to try again later. When I finally reached a receptionist, she took my insurance information and contact details. She gave me a few open dates as I fumbled with my iPhone calendar to find one that worked for me. After booking, I received no confirmation or reminder. When I arrived in the office on that fateful day, I had to fill out a set of forms that included the same information I had already provided over the phone. You can see why I said my dentist could learn from my barber. My barber began building a positive, proactive brand relationship with me long before I stepped into his office. By overwhelming me with the little things, I was ready to put my treasured head of hair in his capable hands. My dentist, on the other hand…I could hardly remember his name. Up until the time I entered his office, he had done the minimum to win my business, and I was entirely lukewarm about his practice. It’s no secret that the U.S. struggles with high healthcare costs. Contributing factors include high prescription drug prices, lofty physician’s salaries, medical records system inefficiencies and administrative costs. Such inefficiencies translate to significant financial drain. The Harvard Chan School study attributed a significant portion of the spending disparity between the U.S. and the other countries to higher administrative costs. Administrative costs only account for 1-3% of healthcare spending in the other countries, while in the U.S., administrative costs come to 8%. Those inflated administrative costs include countless hours spent booking, confirming, cancelling and rescheduling appointments, often by telephone. If you’ve never been interrupted by a ringing telephone in a doctor’s waiting room, you’ve never been to a doctor’s office. But easy, inexpensive relief awaits: A.I.-based, automated, appointment scheduling is already a reality—and an efficient one. You can even customize it to your practice’s unique workflow. Whether or not you choose to implement chat, know that many of your competitors already have. Healthcare IT News recently covered a Florida women’s clinic that turned a thriving-but-inefficient practice into a lean, mean, healthcare machine. The award-winning clinic was overflowing with patients—a double-edged sword for a small clinic that needs patients to keep its doors open but doesn’t employ the staff or the technology to handle their growing numbers. Telephone wait times reached 20 minutes. Front desk staff juggled waiting room patients, waiting callers, waiting insurance companies and waiting bosses. All this waiting gets expensive. And frustrating, for clinic staff and their clients. Further inefficiencies complicated matters, like contacting waitlisted patients manually to fill canceled appointment slots. The women’s clinic chose to implement an automated booking solution that allows the provider to communicate with patients via text. 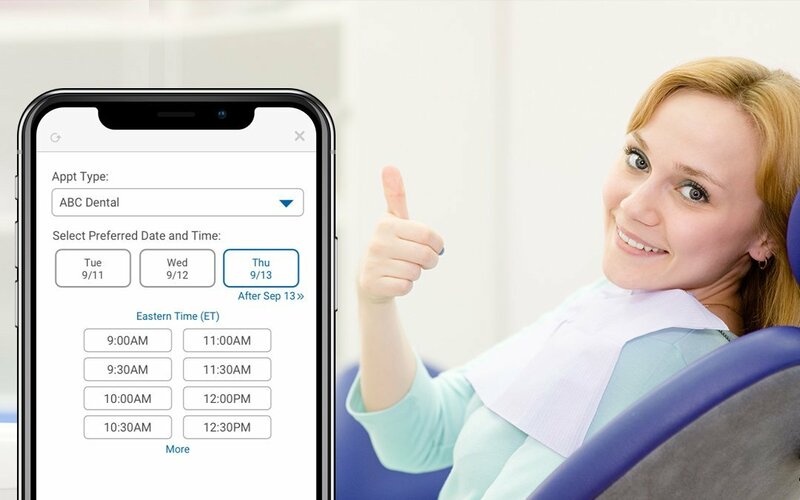 Patients can schedule, reschedule or cancel appointments, and the system automatically fills any canceled slots with the next available patient. Reminders and helpful hints—such as how to prepare for certain types of visit—are sent with little or no human intervention. Healthcare IT News says the clinic can now see about 100 additional patients per month, bringing in an additional $10,000. What’s more, referrals have increased and no-shows were cut in half. While automated appointment schedulers can help growing practices grow faster, they aren’t a cure-all. These systems need patients, and that’s where a healthy online reputation and social media presence come into play. Consumers today live by the online review—they tell us so at every opportunity. Be proactive: request and manage reviews, respond to all positive and negative reviews on major industry platforms, share positive reviews in your marketing and build a great local search engine optimization program. If you’ve got all that covered, kudos! If not, we’re here to help.